U.S. Supreme Court Justice Anthony Kennedy announced his retirement today, which means President Donald Trump will get a second nomination to the bench. Justice Kennedy today advised his colleagues that he is submitting to the President a formal notification of his decision, effective July 31 of this year, to cease active status as an Associate Justice and to assume senior status. He said: “It has been the greatest honor and privilege to serve our nation in the federal judiciary for 43 years, 30 of those years on the Supreme Court.” He added that while his family was willing for him to continue to serve, his decision to step aside was based on his deep desire to spend more time with them. He said, too, that admiration for his colleagues on the Court means that he will retain warm ties with each of them in the years to come. 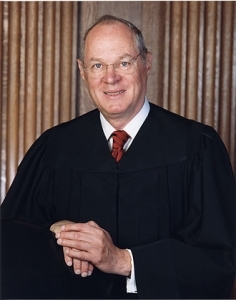 Justice Kennedy was nominated by President Reagan and took his oath of office on February 18, 1988. Through his nomination, Trump could solidify a five-member conservative majority that would put in jeopardy abortion rights and expand gun rights, according to the New York Times. “Justice Kennedy’s voting record was moderately conservative,” states the article about his retirement. “He wrote the majority opinion in Citizens United, which allowed unlimited campaign spending by corporations and unions, and he joined the majority in Bush v. Gore, which handed the 2000 presidential election to George W. Bush. He also voted with the court’s conservatives in cases on the Second Amendment and voting rights. Trump nominated conservative Justice Neil Gorsuch upon entering the presidency to replace the late Antonin Scalia, who died in February 2016 while Barack Obama was still president. GOP lawmakers refused Obama’s nomination. You can read the full NYT article here and SCOTUS blog’s here.